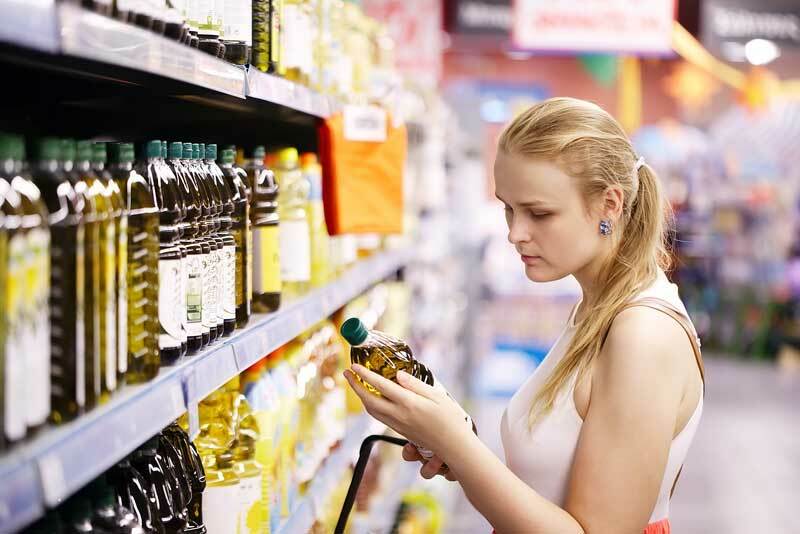 Olive oil labels may have terms like Cold Pressed, Premium, Pure, Monovarietal, Harvest Year – what does it all mean and what is most important? Choosing olive oil is easy once you know some common label terminology. Choosing the “right” oil depends on how much flavor is needed, what the cooking usage will be, and the available budget. It also helps to understand the classifications and the common marketing terms used on olive oil labels. Extra Virgin Olive Oil is the most flavorful and the healthiest olive oil, because it is naturally produced and retains healthy antioxidants from the olives. The range of flavors is very broad, similar to wines, and will depend on the olive type, where the olives are grown, when the olives are harvested, the weather during the growing season, and the processing. Extra virgin olive oils may be strong and peppery or mild and buttery and anywhere in between. Extra Virgin Olive Oils may have marketing terms such as “first press,” “cold pressed” or “cold extracted” on the labels, referring to the fact that extra virgin olive oil is produced by crushing the olives without adding any heat or using any chemicals. All extra virgin olive oil is produced this way even if the label doesn’t call it out. Additionally, extra virgin olive oils might list the type of olive or olives the oil was made from - sometimes referred to as monovarietal or varietal/variety, as well as the country or region the olives were grown. Like wine, these indicators help suggest the typical flavors consumers might expect from that specific extra virgin olive oil. Some manufacturers blend different extra virgin olive oils together in order to offer a consistent flavor profile all the time or to create a unique "coupage" flavor profile. Olive oil is a blend of refined olive oil with some virgin or extra virgin olive oil added back for flavor. Olive oil has a mild olive flavor, making it a great oil to substitute for other common cooking oils like vegetable oil and canola oil without changing the taste of the recipe. Some marketing terms on Olive Oil labels in North America may include “Classic” or “Pure” Olive Oil. When a label calls out “Light Flavor” or “Light Tasting” Olive Oil, it indicates there is very little virgin olive oil in the blend and therefore a very subtle flavor. The fat and calories are actually the same in ALL grades of olive oil. One major area where olive oil is different from wine is the shelf life – olive oils do NOT get better with age. While the harvest date can give an indication of an olive oil's age, the range for an olive oil's shelf life will depend on many things - the type of olive, quality of the fruit, maturity at harvest, harvesting method, milling/processing procedures, growing conditions and the final blend. Bottlers will consider these factors when recommending a best by date. Most olive oils will keep in the original sealed bottle for up to two years under proper storage conditions. When choosing a bottle at the store, check for a best by date that is further out and make sure the bottle doesn’t show signs of mishandling or age such as oil drips or leaks, an orange-y color if in a clear bottle, or dust on the bottle suggesting it has been on the shelf a long time. Experimenting with different olive oils for different types of cooking will help you find oils that best match your flavor preferences and budget.